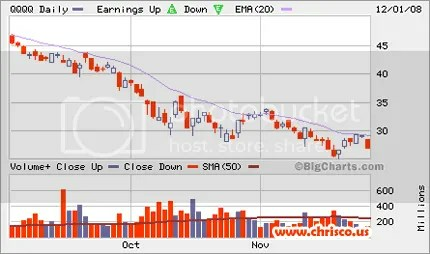 Just closed out all stock positions (long) I put on in the beginning of March: http://bit.ly/3299rF. Biggest gain: RIMM 89%; loss INTU -8%. 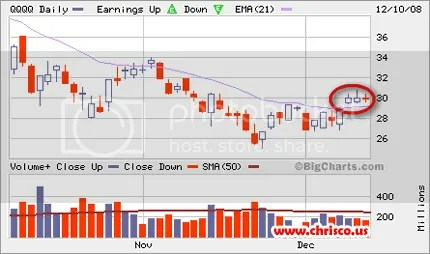 This chart (taken intraday today), shows some very tight, low-volume action above a moving average that has not held for a long time. 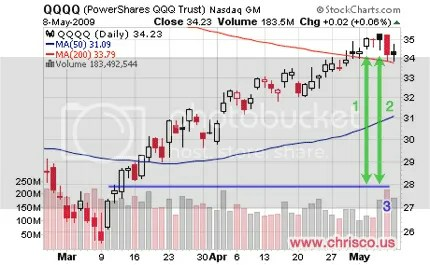 This comes after the gap up of a few days ago, which is also still holding. We really could break either way here, but this action, combined with multiple other signs of decreased fear and flight-to-quality (risk assets and gold are up, spreads are down) and ability to hold on “bad news” (Jobless claims jump to 573,000, a 26-year high), is interesting. The Fed is printing massive amounts of money. It’s going to go somewhere (eventually). Cheers! 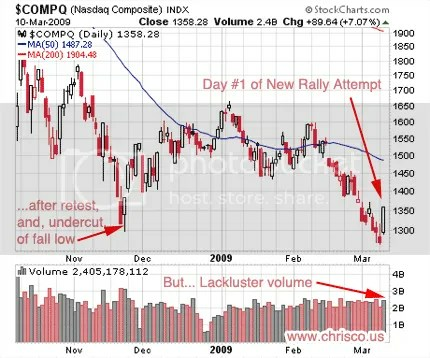 Just a quick post to note the end of the rally attempt (its start was noted here: Market Update: Good News/Bad News). Here is the Yahoo Finance arket summary and here are the volume leaders. 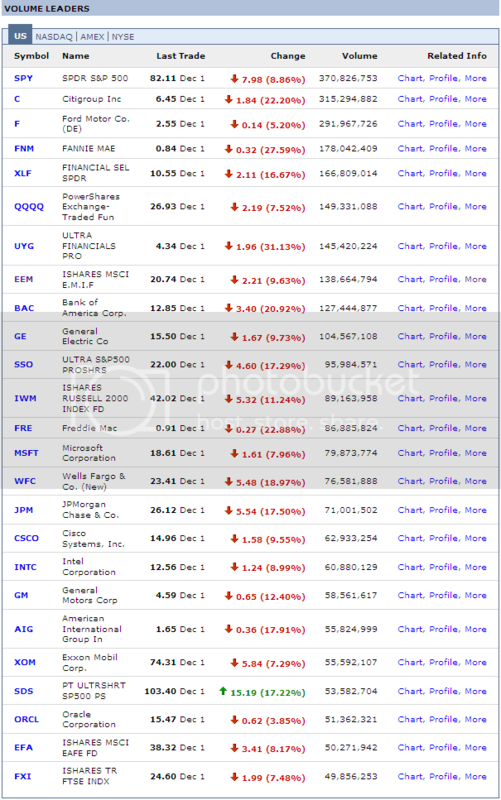 As you can see, it was a 90% downside day and not a single stock was up on the volume leaders list (except a short ETF). Also of note is today’s National Bureau of Economic Research (NBER) “news”: “The economy’s yearlong downturn, officially declared a recession.” I put “news” in quotes because their “economic indicator” (or whatever you prefer to call it) is backward looking, just like all non-market based economic indicators are. Here is an LA Times article and here is the official NBER release. Here is a blog I published over a year ago (in November 2007) saying the U.S. was likely already in a recession and why (includes annotated chart). 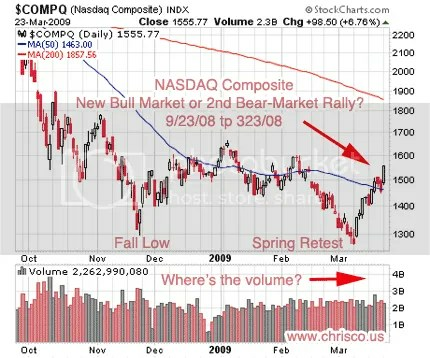 The only forward looking indicators, of course, are market-based ones, such as the stock markets and bond markets themselves, which discount things around 6-12 months in advance, which means (as always), that the bear market low will occur 6-12 months before the recession ends.